Service Hospitality Healthy & Safe Workplaces. Prospering. First HSLC Level 1 Complete! The First … of Many! 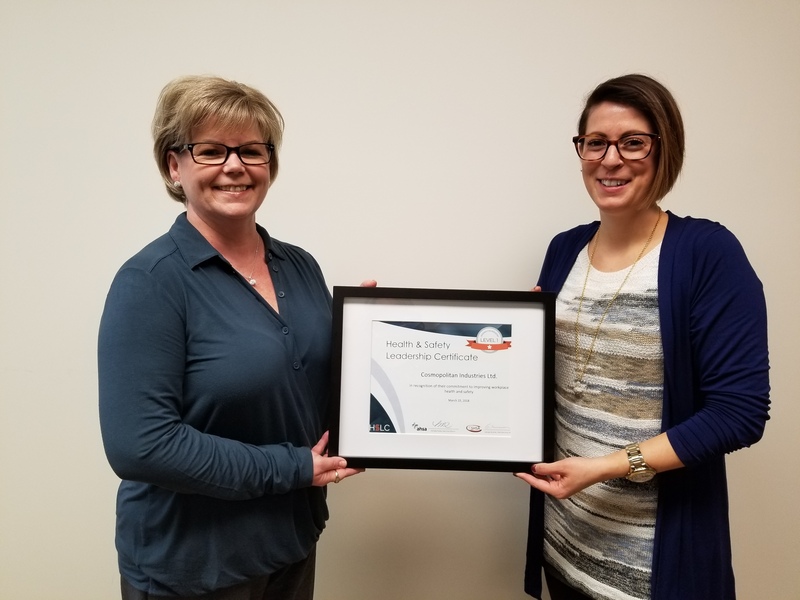 Congratulations to Sharlene Duquette and her team at Cosmopolitan Industries for being the first to complete the Health & Safety Leadership Certificate Level 1! 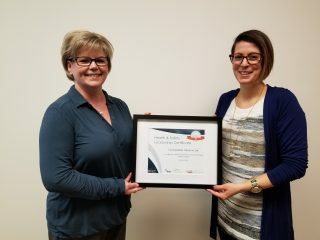 The HSLC started as the Hospitality Safety Leadership Certificate but has since been expanded to a separate, but similar, certification for those employers who do not work directly in hospitality. 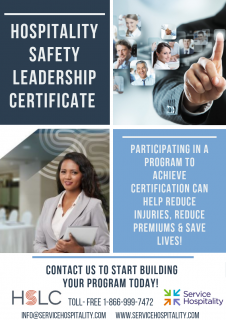 The Health & Safety Leadership Certificate is made up of four levels of certification, with each one helping the organization to build their safety management system. Because there is recognition at each level, an organization can choose to do a few, or as many, of the levels as they choose. 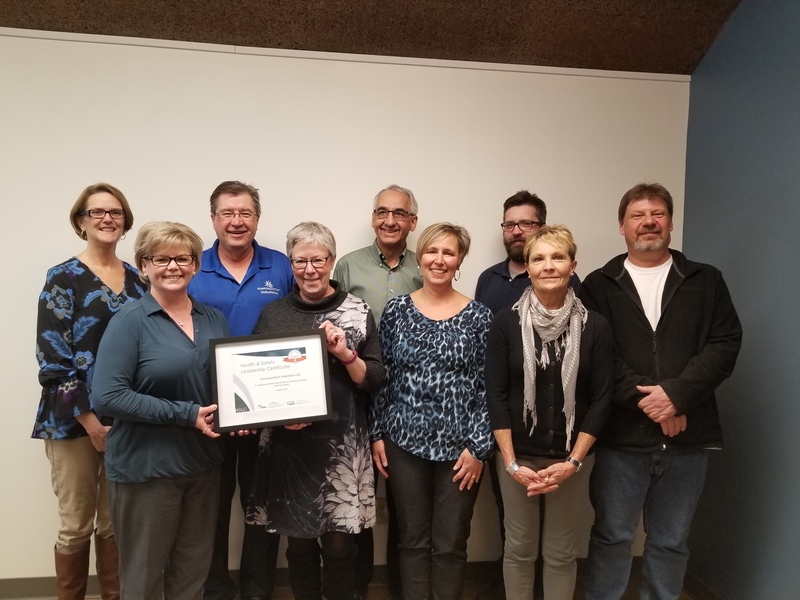 This is a fitting accomplishment, after receiving the Service Hospitality’s highest honour, the Safety Centered Leadership Award, in 2016. Under the leadership of Sharlene, Cosmopolitan Industries continues to be a champion of safety. Cosmopolitan Industries’ is now busy celebrating their successful completion of Level 1 and have already completed the training component for Level 2. For more information about the HSLC program, and what is included in each level, please visit our HSLC page. Throughout the great pattern of things you’ll get an A just for effort and hard work. Where exactly you actually misplaced me was on all the details. You know, it is said, the devil is in the details… And it could not be more correct in this article. Having said that, permit me say to you what exactly did give good results. Your authoring is actually really powerful and that is most likely the reason why I am making an effort to comment. I do not really make it a regular habit of doing that. Next, despite the fact that I can easily notice a jumps in reason you come up with, I am not really convinced of just how you appear to connect the ideas which in turn help to make the final result. For the moment I will yield to your issue however trust in the near future you connect the facts better. You do not need to provide any personal information in order to use this website. If you choose to submit personal or organizational information to Service Hospitality via this website (e.g., e-mail link). We will treat your contact information as confidential and will not share it with any third parties for any reason without your written consent. Get the Latest Safety News Straight to your Inbox! Service Hospitality Copyright © 2019. All Rights Reserved.